At my stage in life, I look to anti-ageing products for prevention, rather than cure, of the signs of age. I've little experience with anti-ageing products but now is the time to learn! Over the past month I have been using the Alva Sanddorn range of anti-ageing natural beauty products and I've enjoyed it. I was going to write you a review all about how I was having trouble identifying the scent of the Alva Sanddorn anti-ageing products but I've just looked it up - it's Sea Buckthorn! Sea Buckthorn plants produce small orange berries that are citrussy in flavour, I tried some sweets flavoured with them earlier this year (eeeeew euuurch). Who would have thought that they would also be great as a skincare ingredient? Sea Buckthorn is high in provitamin A, vitamin E and fatty acids - prefect! The scent is fascinating. Every time I use the Alva Sanddorn Cleansing Milk, I pour the pale orange liquid onto a cotton pad and for a few brief seconds I enjoy that almost-peachy smell but then it warps... and turns into a musty, unpleasant aroma so I hurry up and get on with the cleansing process. 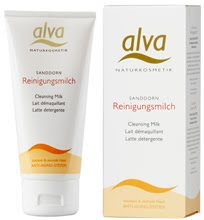 The Alva Sanddorn cleansing milk is a very light lotion that feels great on the skin. I find it refreshing, even before I wash it off. It seems (from the amount of gunk of the cotton pad afterwards) very effective at cleansing and I do find it quite moisturising. I know that if I forget to moisturise before I leave the house in the morning then my skin will feel fine without. The algae extracts, organic jojoba oil and shea butter all add to the moisturising qualities and the Sea Buckthorn protects against UV rays. Alva Sanddorn products are all pthalate, paraben and sulfate-free. The cleanser is good but the toner is great. The Alva Sanddorn Facial Tonic comes in a small glass bottle. It is alcohol free, so great for my slightly sensitive skin and after use, I can feel my face is clean and clear, my pores are open and my skin is ready for action. The smell is a lot less overpowering than the cleanser. I really enjoy using this tonic as it makes my face feel bright and tight. As with the other Sanddorn products, it delivers great moisturising properties too. Alva Sanddorn products are available to buy from mypure who have a wonderful range of organic and natural beauty products.